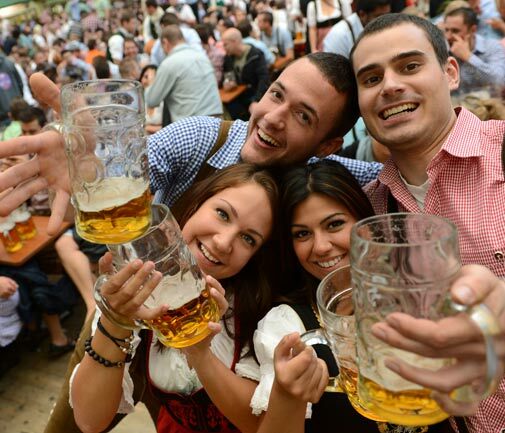 Oktoberfest parties are in full force this weekend with a variety of options for you to sample German beers and enjoy Bavarian food. • Bermuda High School for Girls will host Oktoberfest this evening. The event will feature a beer tasting and Bavarian food tasting and will be held in the Queen Elizabeth Hall from 5:30pm to 9:30pm. Attendees will enjoy authentic German pub music while eating brats with sauerkraut, authentic German pretzels and schnitzel. There will also be a variety of beers, including genuine Oktoberfest beers to sample. Beers available include traditional Oktoberfest brews in addition to niche beers from all over the world, and local favourites. The event is for those who are 18 and older. The Bavarian tasting menu includes grilled Bratwurst sausage with a Bavarian style pretzel, mini schnitzel with German style potato salad with pickles served with a roll and spaetzle, Southern German style noodles sauteed in butter topped with chopped chives, bacon and onion gravy. Tickets are $50 unlimited beer tasting and a Bavarian food ticket. For those who wish to just purchase tickets for beer or food tasting, they are available for $30 and $25 each. Tickets are available www.bhs.bm/index.php/news-events/register or by calling 278-3004. All proceeds will go to the BHS Charitable Trust, which provides funding for various school programmes and initiatives, including the financial aid programme. Oktoberfest celebrations have taken place daily from the end of last month and will finish on Sunday night. A special menu was created by German chef Edi Guntl, owner of Bavarian Beers. There are many options including goulash soup, bratwurst with sauerkraut, curry bratwurst with French fries, half a chicken with German potato salad, Schnitzel, beef stew and so much more. Desserts include apple strudel and Bavarian-style cheesecake. There are also a variety of authentic German beers. Entrees start at $15.50. Reservations are highly recommended. • The Newport, a Gastropub is hosting a three-course Oktoberfest menu for $56. The menu includes goulash soup or Bavarian potato salad for starters, schnitzel with pepper sauce and spatzel or slow simmered beef with gravy, red cabbage and bread dumpling for the main course and marscapone baked pancakes for dessert. • Frog and Onion in Dockyard will be hosting a special Oktoberfest event next weekend in the Victualling Yard. Beers featured will include Samuel Adams and a new beer brewed in Dockyard — the only brewery in Bermuda by brewmaster Jim McLennan. Food on offer will include half spring chicken, a selection of German bratwurst, sauerkraut and German potato salad. There will also besoft pretzels with dipping mustards and fresh apple strudel. The event will start at 5pm nightly. Tickets are available on www.premierticketsglobal.com. For more information, visit the event’s Facebook page.